It's Simon's Show AMERICA'S GOT TALENT Premiere Preview! The world’s largest talent show, NBC’s “America’s Got Talent” returns to television this month for season 11. Returning judges include: Super model Heidi Klum (“Project Runway”), “Spice Girls” singer Melanie Brown (a.k.a. Mel B. ), comedian and game show host Howie Mandel (“Mobbed”, “Deal or No Deal”), and replacing popular disc jockey Howard Stern is executive producer Simon Cowell who is also on the judging panel of “Britain’s Got Talent”. Hollywood Junket got a sneak-peek of the AGT season 11’s auditions which taped in Pasadena, Ca at the Pasadena Civic Center. Judges saw the usual wide range of talent acts from contestants, some of which were questionable. One contestant’s act included a whip chain, while another one had a real unique talent that motivated Simon to say it was the best act so far. MORE AGT Auditions & Exclusive Photos HERE! 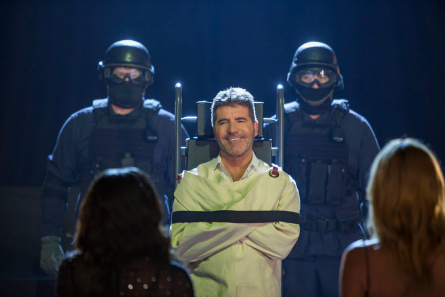 Will audiences of AGT this season see the same snarky Simon remarks that made him a household name from his days of judging the first few seasons of “American Idol”? Keep reading all the judges remarks from the acts below and you be the judge! “A beautiful distraction.” – Mel B. Rose was born in China and now lives in Arizona. Her only talent seemed to be hating Mel B. Rose brought-out life sized card board cut-out standees of all the AGT judges. But, the only cardboard judge that got knocked to the ground by her using a whip chain was Mel B. She got “X”ed by the judges. Heidi said it looked “messy” and was all over the place. Simon didn’t understand what the act was. Cody Carter is a fourteen year old baton twirler. His goal is to twirl for Cirque du Soleil. “Cody the Twirler” received a standing ovation from Heidi and Mel B. “That really made me happy. Great audition,” said Mel B. Howie wanted the music he twirled to (which was classic show boat music) to be more current to make it seem less “campy” and old fashioned. Heidi thought it was extraordinary twirling and it blew her mind. Simon said “this is the best act we’ve seen so far.” Simon went on to say the act had “flair” and charisma. “I think your dream will come true,” said Simon. Mel B. suggested to Cody that she’d like to see him perform in black-light next time. “America’s Got Talent” season 11 premieres Tuesday, May 21, 2013 at 8/7 c pm.